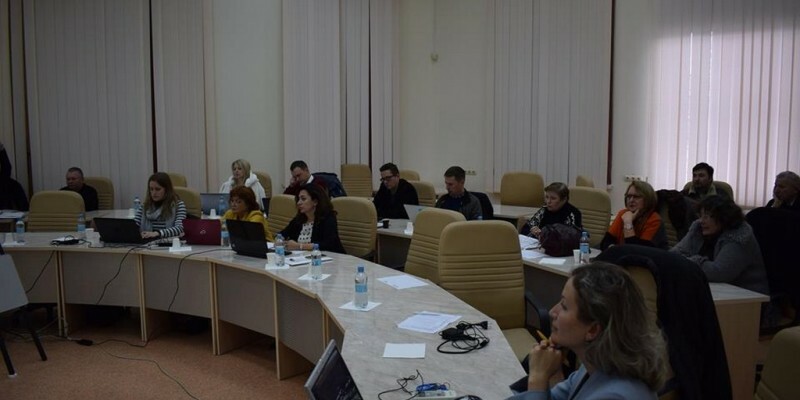 November 14-15, 2018 within the framework of the project “Modernization of Pedagogical Higher Education by Innovative Teaching Instruments” (MoPED) of the EU Erasmus + KA2 Project – Development of the Capacity of Higher Education, No. 586098-EPP -1-2017-1-UAEPPKA2-CBHE-JP was held a regular coordinating meeting of MoPED participants. Borys Grinchenko Kyiv University is the partner of this project. The meeting took place in the South Ukrainian National Pedagogical University named after K. D. Ushynsky, Ukraine. EU Universities were represented by Olga Dziabenko (Deusto University, Spain), Marios Papaevripidou (University of Cyprus, Cyprus) and Bartlomiej Gawel (AGH University of Science and Technology, Poland). Borys Grinchenko Kyiv University was represented by: Nataliia Morze – Vice-Rector on Informational Technologies, Doctor of Pedagogical Sciences, Professor, Corresponding Member of National Academy of Pedagogical Sciences of Ukraine – Project Manager and Mariia Gladun – Senior Lecturer of Department of Computer Science and Mathematics of the Faculty of Information Technology and Management. The meeting began with the greetings of Anton Ananiev – the Vice-rector of the South Ukrainian National Pedagogical University named after K. D. Ushynsky, Ukraine. During the meeting, Nataliia Morze shared presentation “Methodological and Technical Design of the Innovative Class (Recommendations)”, where she presented research results of Ukrainian pedagogical education (visualizing the links between pedagogical tendencies, innovative technologies and participants of the educational process – students, teachers and lecturers). Nataliia Morze gave recommendations to the project participants on the methodological and technical design of the Innovation Classroom (ICR). doing tasks developed by NEAs, detail information on master classes.